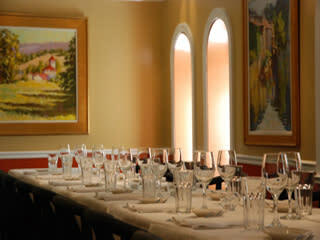 This intimate, private banquet facility includes three separate dining rooms. The main dining room seats up to 60 guests comfortably. This room may also be separated into two smaller rooms providing private accommodations for groups of up to 20 or 30. With an experienced, attentive yet unobtrusive staff at your service, Bloomsbury Bistro is able to accommodate any venue, whether you are making a business presentation or are celebrating a wedding, anniversary or birthday.